Sometimes there is just a single reason to sit down and eat. Hunger. And sometimes that happens in the middle of the night, normally after a couple of beers to many and when most eateries are closed. 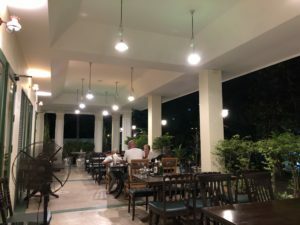 Martins Kitchen serves decent Thai food 24/7, a few steps into Sukhumvit Soi 19 and close to terminal 21. Martins Kitchen have outdoor and indoor seating and the people working here are friendly, but you don’t come here for the ambiance. You come here because you’re hungry and Martins kitchen stays open 24/7. And the food is good and just what you need before going home after a few beers late at night. But we are not talking about excellence here. We are talking about good food to serve your basic needs before you throw your head onto the pillow. The flavors are balanced and definitively Thai. Most customers here are Thai’s, including a lot of office workers during day time. If you like it spicy tell them, otherwise they believe you don’t wont it spicy, which hamper the balance a bit. My standard order is Pad Kra Pao Gai (Thai basil chicken). The beef version also tastes good, but the beef is a bit to chewy, so I have stayed with the chicken option. Thai basil chicken, known as Pad Kra Pao Gai, is one of the more popular street food dishes for Thai’s and a typical dish they order when lacking a clear idea of what to eat. It’s easy to make, it tastes good, most restos’ can make it and it’s basically always available. 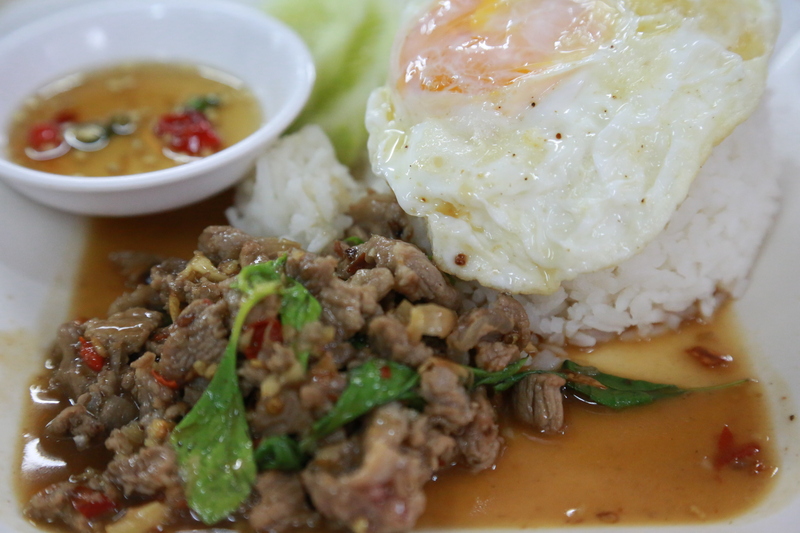 Pad Kra Pao comes in many versions when it comes to the protein source. Meat is the most common option, but also squid, shrimp, or even tofu is sometimes available. The clue is the balance of garlic, chili, soy and oyster sauce and to use enough holy basil. Most people prefer to have an egg on top. I prefer the street side seating when at Martins Kitchen night time. If you go there daytime, the fan room on first floor, above 7-Eleven, is an option to avoid the heat. Local office workers in the area, come here mostly daytime for breakfast or lunch. The late night cliental is more of a mixed bag. 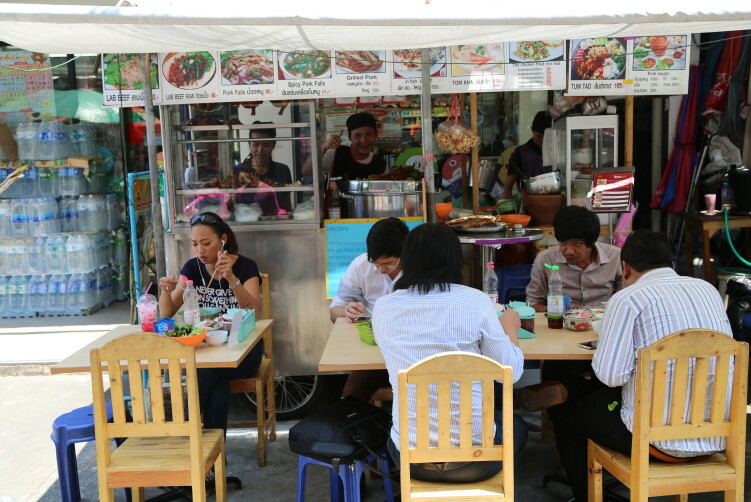 The indoor seating is a mix of tables and storing room as most easy going Thai eateries normally are. The service is quick and the owner speaks a bit of English. All the food is made outside on charcoal or gas. buy now Food: A short menu of Thai food including Pad Kra Pao (with chicken, pork, beef or shrimps) and chicken noodles. Big enough menu to find something you like. order now Price: Cheap and good food. How to get there: Take the BTS to Asok and walk down on the Terminal 21 Side. Walk down Sukhumvit Soi 19 for about 100 meters and you find it in front of the 7/11 and above(the inside seating) and next to City Lodge.